As Mark Twain, once wrote, “The report of my death was an exaggeration.” And there were elements of that in the reporting of troubled Truro City’s final demise late last week. It’s all been happening at Treyew Road of late, the end already announced when, just after 5pm last Friday (October 19), it emerged that nightclub owners and a taxi boss had stumped up £50,000 to keep the club playing, at least until the end of the season. On Tuesday night they were back in Blue Square Bet South action, when Staines Town’s Louie Theophanous’ 15th-minute strike sealed a win for the Surrey hosts against their Cornish visitors, leaving the White Tigers 12 points adrift at the bottom of the table after having 10 points docked when they entered administration in August. Pete and Jason Masters, from the city’s L2 nightclub, and Philip Perryman, owner of A2B Taxis of Truro, decided on Friday afternoon to put up the bond demanded by the Football Conference as a condition of Truro staying in the league. Yet City boss Lee Hodges continued to face player shortages as his threadbare squad tries to cope with injuries to key players ahead of Saturday’s league visit of Sutton United (October 27). That quote sums it all up, the club still subject to a transfer embargo as their new backers look to take the club out of administration, but there’s an air of positivity at Cornwall’s premier football club, and it’s clear that – perhaps against popular perception -there’s a real appetite for the Beautiful Game across the Tamar. 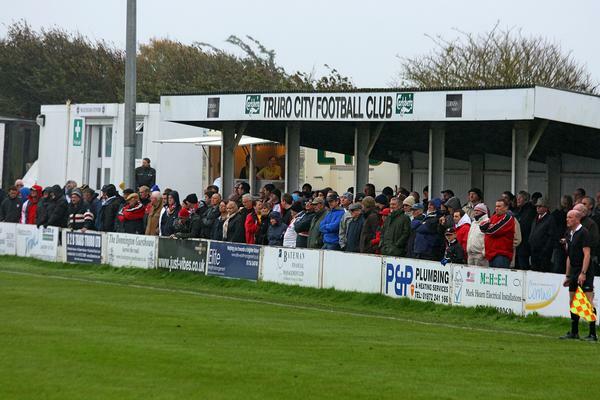 There may be rocky times ahead at Truro, but hopefully the crowds will return to Treyew Road, in just the latest example of a club on hard times determined to stay afloat. It was only a week before Truro’s deadline traumas that Non-League Day was hailed a huge success, a gap in the top divisions’ fixture list leading to bumper crowds all around our local club scene. But for all the bumper gates on the day – the international break seeing the top divisions without scheduled matches – stories like those at Truro and former Conference high-fliers Kettering Town suggest we can’t be complacent, the latter Northants outfit currently drowning in a sea of CVAs, unpaid bills and knock-on postponements. For every wonderful tale of achievement in non-league football and grass roots sport in general, there is a cautionary tale elsewhere to pay heed to. Anyone who has followed the story of Lancashire coastal outfit Fleetwood Town in recent times will know just what can be achieved. It wasn’t so long ago that the Cod Army were looking to escape the nets cast into the lower reaches of the old UniBond League. And just look at them now, the days when Highbury Stadium (to the uninitiated, yes, Highbury Stadium) was crumbling around them and the town was just seen as the end of the Blackpool tram line now long behind them. You could say the same about fellow Lancashire hotpot/beds of football like Accrington Stanley and Morecambe, and so many clubs from my adopted county have had their day in the sun before, clubs like Bamber Bridge rising from parks football to the summit of the NPL, as did fellow Red Rose minnows Colne Dynamoes a few seasons before. But the latter’s internal combustion after a 1990 title win and the Conference’s resultant refusal to accept them still serves as a warning of what can go wrong. However, there is still belief at Truro City, even if the fate of the Cornish outfit following a mesmeric rise to the second tier of the pyramid remains in the balance. And if nothing else, let City’s plight be a salutary lesson to all local club officials and volunteers that success can’t be taken for granted, and you really do need to cut your cloth accordingly to survive. An earlier version of this Malcolm Wyatt article featured on the http://www.sportnw.co.uk website on October 15, 2012. This entry was posted in Football, sport and tagged Colne Dynamoes, Conference South, Cornwall, Fleetwood Town, Kettering Town, non-League Day, Staines Town, Stewart Yetton, Truro City, Woking. Bookmark the permalink. Good write-up Malcolm. The article is also featuring on trurofans, with the relevant link backs and credits. Thanks. Steve.